Yellow vinyl with a banana scented scratch & sniff sleeve. Indies only green vinyl, with a banana scented scratch & sniff sleeve. The Lemonheads follow up the critically acclaimed ‘Varshons’ from nearly ten years ago with another eclectic collection of covers. ‘Varshons 2’ is a hokey jukebox filled with unique versions of Yo La Tengo, Nick Cave, The Bevis Frond, NRBQ, The Eagles, Paul Westerberg, The Jayhawks, Lucinda Williams and John Prine. 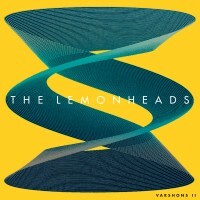 Barry says: Though it's been ten years in the making, the second iteration of their 'Varshons' series sees The Lemonheads covering a host of excellent originals with style and grace. Where else could you get a masterful combo of John Prine and Nick cave on the same LP? Not many places i'd wager. A superb second outing, and yet more proof of the Lemonheads' continuing relevance.